So you’ve just seen Black Panther over the weekend, and you’re smitten with Chadwick Boseman. I don’t blame you: The star of Marvel’s hit movie brought such emotion and gravitas to King T’Challa, and he didn’t look *half bad* in the new Black Panther suit his sister Shuri designed for him. Or maybe you can’t stop thinking about how Michael B. Jordan wasn’t actually playing a supervillain at all but that his Erik Killmonger was actually right (if a little too forceful) about his views for Wakanda’s future and its presence in the world. He did not deserve to be abandoned! Or maybe, despite his questionable decision-making, Daniel Kaluuya’s W’Kabi had his heart in the right place and knew when to put aside his differences and yield to his love at the right moment, ultimately stealing your heart. But you can have all of those stars, because as far as I’m concerned Winston Duke is my new internet boyfriend. After my second viewing of Black Panther this weekend (yes, I’ve already gone back for a second helping, can you blame me? ), I can’t stop thinking about how M’Baku steals every scene he’s in. From his very first scene where you think he’s the villain, trying to usurp T’Challa for the Wakandan throne, he makes his intentions known. He doesn’t think T’Challa is the rightful king of Wakanda. He tries to fight to the death to become king himself, but T’Challa, shockingly, beats him fair and square. 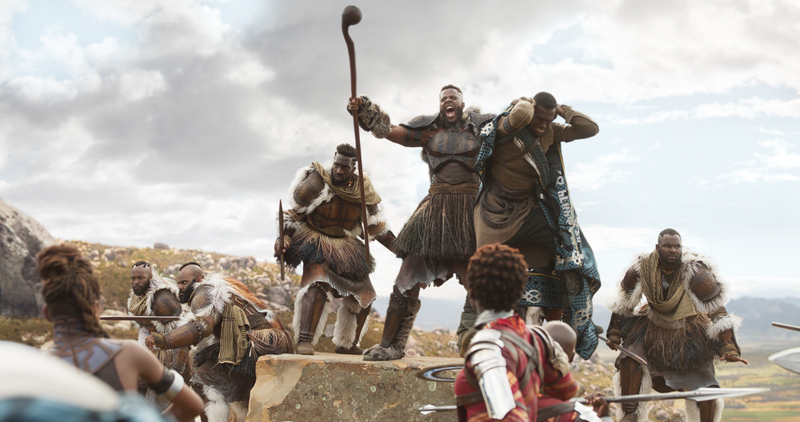 M’Baku sulks off with the rest of the exiled Jabari tribe in shame from his defeat, as he seemed to have the height and strength to easily best T’Challa, to no avail. You think he’s going to keep holding that against T’Challa and come back around to try something sinister later in the film, but he ends up surprising everyone. Not only does he save T’Challa’s life, he also gives up the once-in-a-lifetime chance to become a Black Panther himself when Nakia takes the last remaining heart-shaped herb to the Jabari tribe and offers it to M’Baku, believing T’Challa to be dead. Nakia, Shuri, and Queen Mother Ramonda have no idea that M’Baku has an unconscious T’Challa just a few feet away in another room, so he easily could have taken the heart-shaped herb himself to then take down Killmonger and save Wakanda. But he gives up his dream of being a Black Panther and takes the women to T’Challa to help restore the rightful King of Wakanda to the throne. And then later he saves everyone’s lives by leading the Jabari tribe into the battle against Killmonger at the exact right time when Wakanda is about to lose everything. He even promises to keep T’Challa’s mother safe when things turn dangerous, so he’s got a big heart to go along with those big muscles. Not only is he the true hero of Black Panther, but M’Baku is also funny. Like, really and truly hilarious. He’s sarcastic, he’s witty, he knows how to deliver a scathing (but accurate) insult and he has no time for anyone else’s scenery-chewing. And while some of that can be contributed to the writing and directing, it’s clear that M’Baku wouldn’t be half the hit his is without Duke bringing him to life. Are you as obsessed with him as I am? Then here’s everything you should know about your other other other Black Panther crush. This is his first movie role. Yeah, Duke really lucked out by landing the movie role of a lifetime for his very first film. He didn’t just dip his toe in the film pool, he dove off the deep end headfirst, and hopefully this is the beginning of a long and illustrious movie career for him. He’s been in a few TV shows, though. With a recent three-episode stint on Modern Family as Dwight, as well as seven episodes of Person of Interest as Dominic, and three episodes of The Messengers as Zahir, Duke had some luck on the small screen before Black Panther. He was also in an episode of Major Crimes and Law & Order: SVU. He’s as imposing in real life as he looks onscreen. The 31-year-old actor towers over everyone at a staggering height of 6’5″. There’s a reason T’Challa looks like a rag doll in M’Baku’s arms, and that reason is not movie magic or CGI. Duke really is that much bigger than Boseman. He’s from Tobago. Duke was born on the island of Tobago (in The Republic of Trinidad and Tobago off the coast of Venezuela) but moved to the U.S. when he was nine. So thank you, Tobago, for gifting us all with this heartthrob. He was friends with Lupita Nyong’o before filming Black Panther. The two stars actually met while studying at Yale, which makes a really good argument for staying in school. Maybe you too could befriend someone as cool as Duke or Nyong’o and then star in your own Marvel movie together. He made us all fall in love with an extremely problematic Marvel villain. Did you know that M’Baku is actually known as *Man-Ape* in the comics? That’s a real thing. In the comics, M’Baku killed a rare white gorilla, bathed in the blood and ate its flesh to gain powers and become Man-Ape, and plotted to kill the Black Panther and bring Wakanda to a more primitive lifestyle. He constantly teamed up with the bad guys and yet somehow Duke made this power hungry, angry villain empathetic and good. I truly never thought I’d be into someone named Man-Ape, but here we are. He’ll be back in the MCU. Here’s the really good news: Duke isn’t done playing M’Baku. He’s already confirmed to be appearing in Avengers: Infinity War, which means M’Baku is probably going to save the day once again in Wakanda with his Jabari tribe. Honestly would you expect anything less when Thanos threatens the whole world? But no matter which of the male actors in Black Panther you can’t stop thinking about, at least we can all agree on one thing: it was actually the women in the movie who were the real heroes. Who run the world?